IFP has taken a look at the front pages of newspapers on Saturday and picked headlines from 17 of them. IFP has simply translated the headlines and does not vouch for their accuracy. 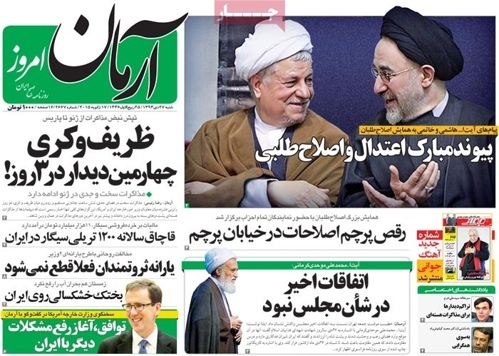 Nuclear talks in Europe between representatives of Iran and P5+1 dominated the front pages of most Iranian dailies on Saturday. 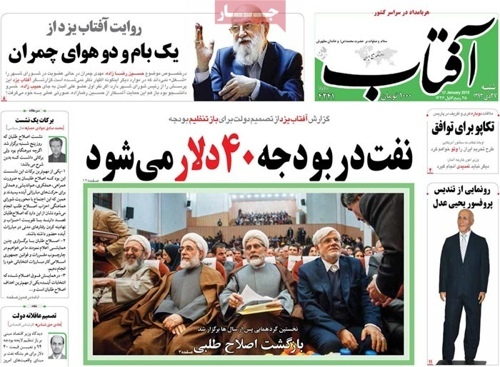 Calls by senior clerics at their meetings with the economy minister for measures to streamline the economy and rallies in Iran and elsewhere in the world in condemnation of desecration by Charlie Hebdo of Islamic sanctities made front-page headlines too. 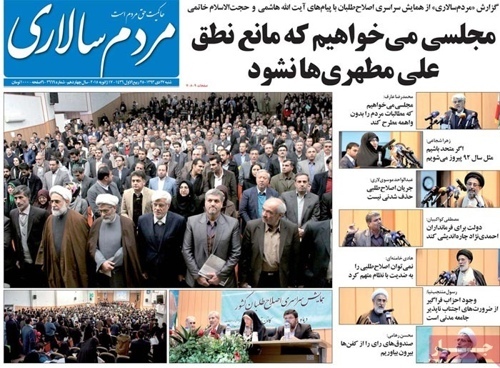 Reformist dailies dedicated their front pages to a gathering of reformists, a first in six years, in preparation for parliamentary elections in early 2016. 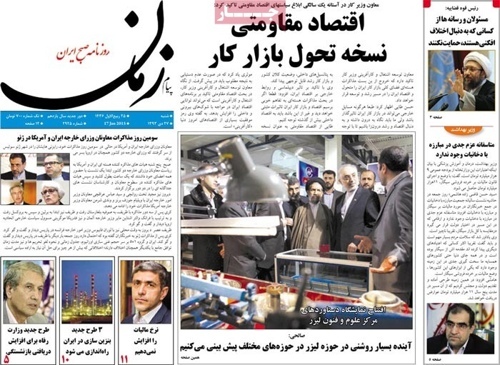 Abrar-e Eghtesadi: Indian oil imports from Iran have increased following the Geneva deal. 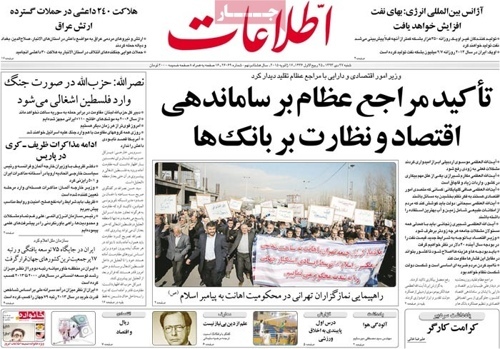 Abrar-e Eghtesadi: “[Nuclear] talks have posted progress,” said the Iranian foreign minister. 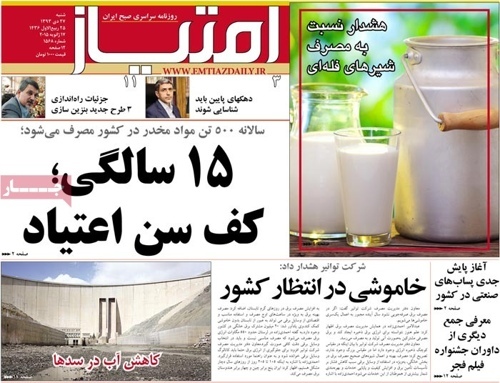 Abrar-e Eghtesadi: Iran and Turkey have finally reached a deal over tariffs on crossing the border. 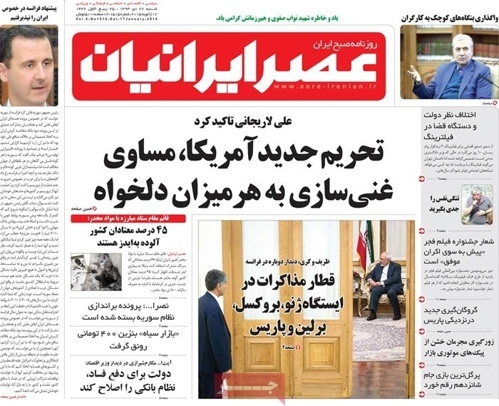 Afarinesh: [Parliament Speaker Ali] Larijani has said that MPs have a new plan on enrichment in case new sanctions are imposed on Iran. Afkar: Reports that Major General Ghasem Soleimani [who leads the Quds Force of the Islamic Revolution Guard Corps] has been wounded in Iraq have been denied. Aftab-e Yazd: The government has decided to readjust next year’s budget, this time the package will envision oil prices of $40 a barrel. Arman-e Emrooz: Iranian Foreign Minister Mohammad Javad Zarif and US Secretary of State John Kerry have held four meetings in three days. 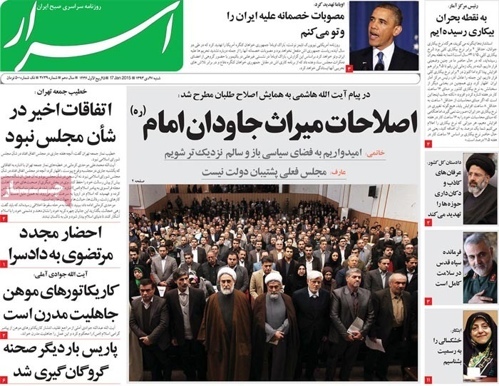 Arman-e Emrooz: President Rouhani has turned down the proposals of two Cabinet ministers on subsidies. The rich will continue to receive cash subsidies. 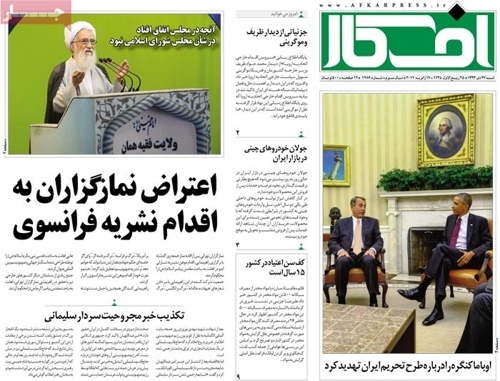 Asr-e Iranian: “New sanctions would mean Iran would pick up uranium enrichment at a level of its choosing,” said Parliament Speaker Ali Larijani. Asr-e Iranian: Up to 45 percent of Iranian addicts are HIV-positive. Emtiaz: Each year some 500 tons of illicit drugs is seized across the country. Emtiaz: Water levels in dam reservoirs have subsided. 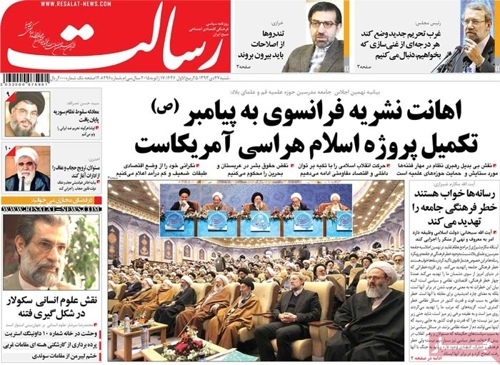 Etemad: An “I love [Prophet] Muhammad” campaign has been launched. 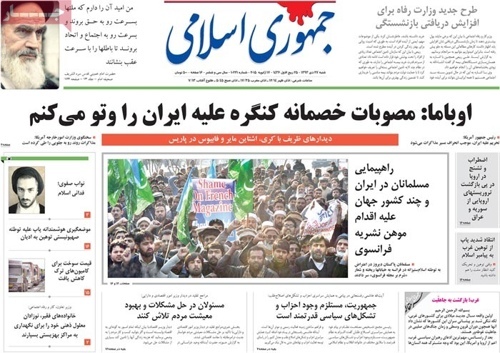 Ettela’at: After Friday prayers in Tehran, worshippers staged a rally to condemn [the French weekly Charlie Hebdo’s] insults at the Prophet Muhammad. Ettela’at: At meetings with the minister of economy and financial affairs, sources of emulation have underlined efforts to streamline the economy and regulate banking. 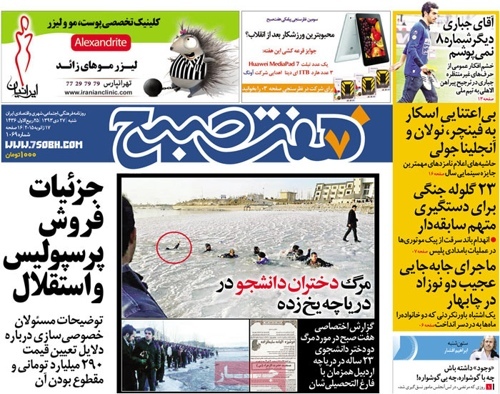 Haft-e Sobh: Two female students have died when ice covering a frozen lake in Ardebil caved in. Iran: Former President Mohammad Khatami and Chairman of the Expediency Council Akbar Hashemi Rafsanjani have sent messages to a gathering of reformists. 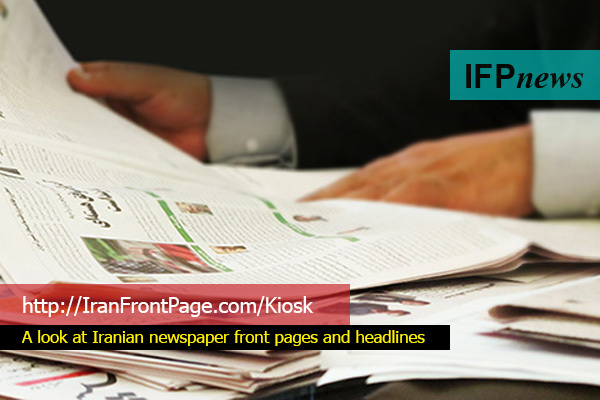 Jomhouri Islami: Muslims in Iran and several other countries have staged rallies in condemnation of a French weekly’s publication of cartoons insulting the Prophet. Jomhouri Islami: “Republicanism requires powerful parties and political institutions,” said Ayatollah Rafsanjani in a message to a reformist gathering. 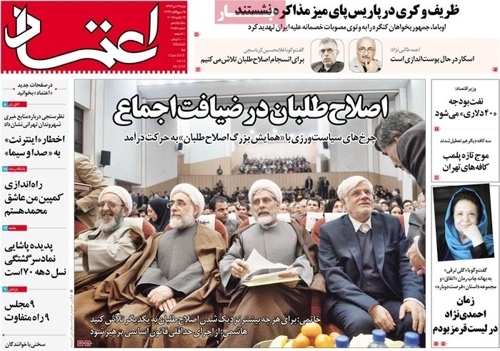 Mardomsalari: “We want a parliament who fights for public demands without being afraid of consequences,” Mohammad Reza Aref, a former vice-president and reformist heavyweight, told a gathering of reformists. 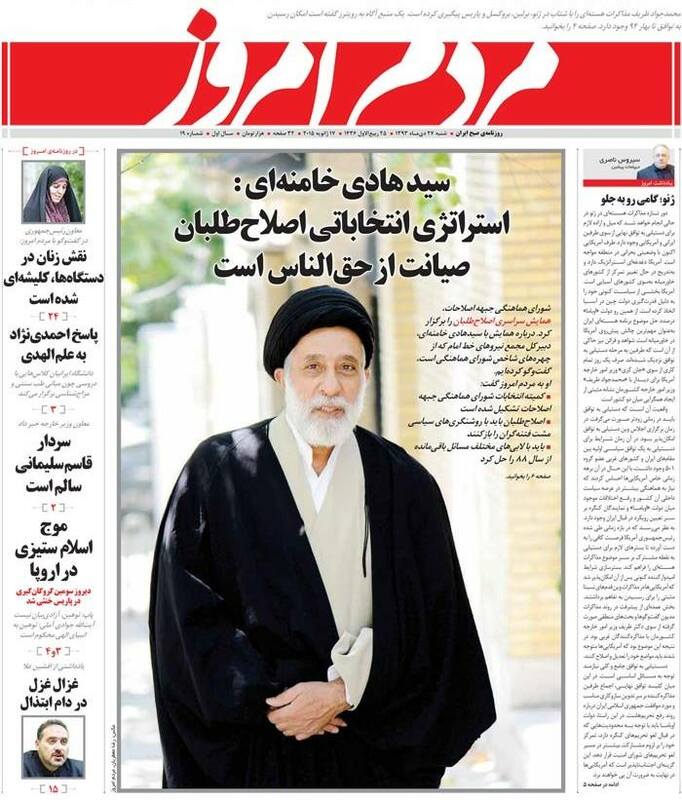 Mardom-e Emrooz: Iran and the US have started drafting the nuclear deal. 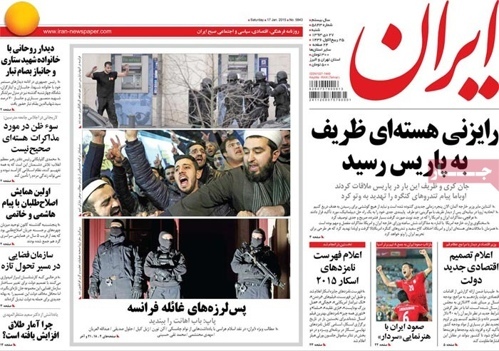 Mardom-e Emrooz: “The electoral strategy of reformists is to protect the rights of the people,” said Seyyed Hadi Khamenei [a senior reformist leader]. 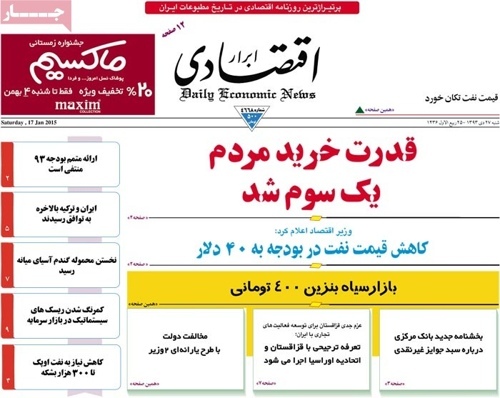 Payam-e Zaman: “Tax rates won’t increase,” said the minister of economy and financial affairs. Payam-e Zaman: An exhibition showcasing the country’s laser achievements has opened. 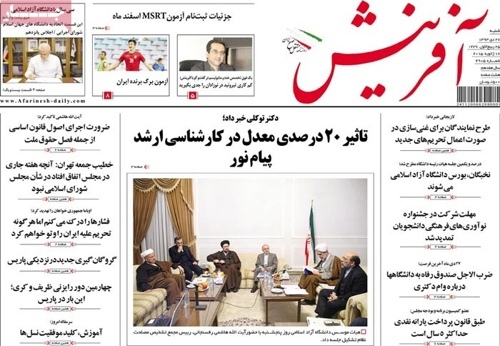 Resalat: “Hardliners should leave the reformist camp,” said Sadegh Kharrazi, a member of the newly-formed NEDA [Farsi initials for a Second Generation of Reformism] Party.